Whether you’re an experienced hunter or just starting out, a trail camera can be an invaluable tool in your arsenal. Nobody wants to sit up on a tree or hide behind some bushes in an uncomfortable position for hours on end, hoping for a glimpse of your prey. With a trail camera, all you need to do is strap it to a tree and just leave it there. The trail camera with its motion sensors will capture pictures and relevant information every time an animal passes by its near vicinity. You can review these images and learn about the habits of your prey in the comfort of your home, before stepping out into the wilderness with your gun. Choosing the right trail camera can be a daunting task. Here’s a list of the features you should keep in mind while making your choice. There are two types of trail cameras as far as flashes are concerned, each with its own sets of advantages and disadvantages. The variant with an infrared flash won’t startle away animals with a sudden burst of light, but the downside is that all your photos at night will be in black and white. The ones with incandescent flashes will capture clear photos in color, but the white flash may scare animals away from the area. Heat or motion usually trigger trail cameras. Each camera has a particular radius of detection and a trigger and recovery time. The wider the radius of detection, the more forested area your camera covers. Trigger time means the span of time between when an animal is detected, and the photo is shot. Recovery time refers to the time required for the camera to prepare itself for the next shot. If there are multiple animals in the vicinity, you would want both these times to be as small as possible, preferably less than one second. Another critical detail to consider is the battery life and memory storage. Because your camera is likely to be out in the forest throughout the night, it needs a decent amount of battery power to keep running and enough storage capacity to store all the images. The ones with a video recording feature usually require even more memory and battery longevity. To make your task simpler, we have compiled a list of what we think are the Best Trail Cameras of 2019! Coming in at no. 10 in our list is the Stealth Cam P18 7 Megapixel Scouting Camera. This camera boasts an energy efficient design, offering three separate modes guaranteeing you maximum coverage at optimum battery levels. Equipped with a rugged, camouflage casing, it can endure extreme climate and environments with absolute ease. It can record 15 seconds of video per shot and can take up to 6 images in a row, utilizing it’s patented Burst Rapid Fire mode. Outfitted with 18 infrared emitters, it is capable of taking photos even in pitch-black darkness. 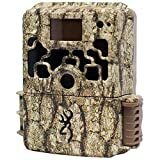 Next on our list is the Crenova Game and Trail Hunting Camera. Equipped with two motion sensors and a 120-degree field of vision, you can bet no animal is going to get by this camera unnoticed. 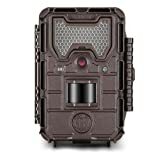 The 12-megapixel camera also allows you to record video in stunning 1080p High Definition format, giving you some of the clearest images you’ll ever get with a trail camera. It also features an LCD screen, making it very easy to use and also gives you password protection. The night vision is truly top-notch with a 42pc LED infrared flash system. The Tec. 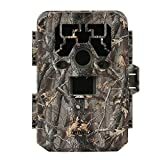 Bean 12 MP Game and trail hunting camera is equipped with a feature called Motion Freeze which is designed to optimize battery usage. With a very impressive trigger time of only 0.6 seconds, it can capture up to 9 shots when the motion sensor is triggered. A 2 inch LCD screen lets you view your images on the device itself, removing the need for any additional hardware. There are 36 infrared flashes in invisible black light, allowing you to record everything regardless of time of day. Ranking in at no. 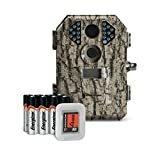 7 is the Moultrie A-20 Mini Game Camera. This camera is especially rugged and is designed to be shock and weather resistant. The best feature of this camera is the dedicated mobile app which gives you wireless connectivity of your camera through your smartphone. It has a very extensive detection radius of 50 feet, but the trigger speed is not too great. With 32 infrared LED’s, night vision is of top quality. Equipped with a ton of additional features, the 12 Megapixel Bestguarder IP66 is currently one of the best buys on the market. It is capable of capturing both High-Definition video and audio from 75 feet away. A patented motion detection technology makes this camera ideally suited for tracking cold-blooded animals, better than any other camera on the market. Additional accessories include a time-lapse feature and the ability to capture GPS location, date, time, barometric pressure and more. This model from Bushnell gives you an insanely fast trigger speed, clocking in at a mere 0.3 seconds, ensuring that no animals slip by unobserved. Giving you the flexibility to choose between 3, 8 or 12 megapixels, you can potentially store a lot of images on your memory card. With an infrared hyper-sensitive night vision range of 80 feet, it performs flawlessly under zero to nominal light conditions. This model features the Data Stamp technology which can record the time, location, moon phase and prevalent temperature of each and every shot. This feature, coupled with the hyper night vision and field scan functionalities allow it to capture every single detail, even with a fast-moving target. This camera boasts a battery life of 1 year, and you can even throw in a solar panel to keep it running continually. Retaining all the features of its low-glow cousin model, the no-glow model adds a few additional features as well. The 48pc no glow infrared led flash allows you to take images of all the nocturnal animals while making sure the camera remains undetected. It also has an anti-reflective cover further enhancing its invisibility. 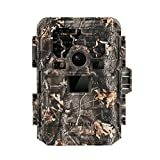 Despite being one of the smallest trail cameras on the market, the Browning Strike Force Sub Micro 10 megapixel camera is no short of an image-capturing and video-recording powerhouse. It can record High-Definition video along with sound over an immense range of 100 feet. The highly intuitive Time Lapse software allows you to capture free animals with absolutely no blur. We have been saving the best for the last and the Stealth Cam G42 No-glow camera scores top position in our list of best trail cameras. This camera model is perfectly adapted for shooting images of unsuspecting animals in the dark with its invisible infrared flash and advanced anti-blur technologies. It is also highly customizable allowing you to set your quality fro 2 to 10 megapixels and also recording duration from 5 to 180 seconds. Aside from the enormous 100 feet range, it also hosts numerous additional features such as a burst mode, a multi-detection mode and also password protection. Thus concludes our list with the Stealth Cam G42 as our pick of choice. Experienced hunters require more than just a gun and having in-depth knowledge of your prey beforehand is essential to a successful hunt. Rest assured you’ll never go wrong with any of the above choices and they’re sure to give you that extra edge which you’ve been looking for.